Joran van der Sloot is accused of trying to extort more than $250,000 from Natalee Holloway's family. He describes himself as "impulsive"
(CNN) -- In a jailhouse interview with a Dutch television station, Joran van der Sloot said he is remorseful for telling so many stories regarding the 2005 disappearance of Alabama teenager Natalee Holloway, but once again denied culpability in the case. "For everything that's happened since 2005, all the things said in the media and everything, I feel guilty for, yeah," van der Sloot, 22, said in the interview, portions of which were aired on NBC's "Today" on Tuesday. The Dutch citizen is jailed in Lima, Peru, where he is awaiting trial on a murder charge in the death of Peruvian student Stephany Flores. Her body was found in May in a hotel room registered to van der Sloot, which the two were seen entering on surveillance camera video. He also is charged with a count of wire fraud and a count of extortion in Alabama for allegedly trying to extort more than $250,000 from Holloway's family in return for disclosing the location of her body. Holloway was last seen in the early hours of May 30, 2005, leaving an Oranjestad, Aruba, nightclub with van der Sloot and two other men, brothers Deepak and Satish Kalpoe. She was visiting the island with about 100 classmates to celebrate their graduation from Mountain Brook High School in suburban Birmingham, Alabama. Van der Sloot was arrested twice in Aruba in connection with Holloway's disappearance, but was never charged. He has denied responsibility for her disappearance. In the interview, van der Sloot said he feels guilty about his father's fatal heart attack, for not listening to his mother and for telling lies, as well as his past behavior. "I was doing a lot of things that I shouldn't have been doing, and mostly only going out all the night and sleeping all the day," he said, describing himself as "impulsive." Asked why he's told so many different stories about the Holloway case, he said, "There were people who were paying me to make up stories, and I was really good at making up stories. Everybody keeps coming at you asking questions ... if you want something, I'll tell you whatever you want to hear, sure." Still, he said, he has "misused the situation for my own advantage." He said he feels bad about that and would take it back if he had the opportunity. It's a familiar refrain, said John Q. Kelly, an attorney for Holloway's mother, Beth Twitty. "He's always a victim. He's always seeking attention. He's always misunderstood and someday he's absolutely going to tell the truth," Kelly said on NBC. "... He's a pathological liar." He said it was van der Sloot who contacted him about revealing the location of Holloway's body in exchange for payment. "We knew he was going to lie, and was going to make up the basis for wire fraud," Kelly said. "It's attention-seeking behavior, as simple as that," he said. "He wants to be in the spotlight ... he just can't help himself." Van der Sloot would not answer questions about the Flores case, saying it is "not in my best interest to talk about it at all." But he maintains police tricked him into making a confession, saying they would not let him call his mother, talk to anyone or arrange for an attorney. Police said van der Sloot admitted that he attacked Flores, 21, on May 30 after she read an e-mail in his computer connected with the Holloway case. After killing Flores, police say, van der Sloot took money and bank cards from her wallet and fled to Chile, where he was arrested June 3. He was returned the next day to Peru. Asked about the extortion case, van der Sloot said, "I have had five years long that people have just been blaming me for something, and yeah, I have a lot of anger built up because of that." He said the Holloway family kept insisting he had information, and wanted to give him the money, so he thought, "I've already told a lot of different stories. I'll do it again." He added, "I know it's very wrong." On Twitty's reaction to that statement, Kelly said, "I think in deference to Beth, I won't repeat what she said about what he had to say." He said he isn't surprised that van der Sloot admitted the extortion, saying he has more than three weeks of e-mails between himself and van der Sloot, as well as audio and videotapes. Van der Sloot said in the interview he wished he'd gone along with his mother's plan and sought psychiatric treatment, but instead he took the money and went to Peru to gamble, according to NBC. Van der Sloot also spoke about Flores' family, saying, "I feel really bad that her family had to lose a daughter. It really does hurt me. I think about it all the time." Asked if he will ever disclose what happened, he said, "When I speak to the judge, and the time is right, I'm going to tell the whole truth, absolutely." "I've got 20 e-mails where he says he's very sorry for what happened, he's going to tell the truth, absolutely," Kelly said. "... He's just incapable of it." He said if van der Sloot ever does tell the truth, he believes it will be out of a sense of self-preservation and fear -- not his conscience or respect for either Holloway's or his own family. In the interview, van der Sloot acknowledged he has a "web of problems. But I created all of them myself, so yeah, I have to deal with it now, deal with the consequences." Van der Sloot also admitted he extorted money from Holloway's family in an interview with a Dutch newspaper. His attorney in the Flores case suggested Monday that his comments may have been mis-translated. 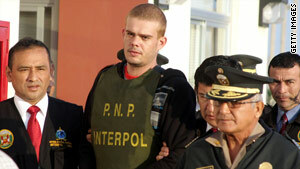 In that interview, van der Sloot told the Telegraph he wanted to "get back at Natalee's family. Her parents have been making my life tough for years." "When they offered to pay for the girl's location, I thought: 'Why not?'" he said. "Maybe there were some mistakes in the translation," said attorney Maximo Alteza, who said he is not involved in the Holloway case. Also Monday, a Peruvian court voted 2-1 to reject van der Sloot's contention that he is being held unlawfully, but the court requires three votes to secure a decision. Alteza said that a fourth jurist will hear the case and cast a vote at a public hearing next week. If that judge votes in favor of van der Sloot, a fifth judge will hear the case to break the tie. Alteza said that van der Sloot's constitutional rights have been violated and he "could be released because of the mistakes made by the police during the investigation." But Kelly pointed out Tuesday that if he is released, van der Sloot will be held in Alabama on the charges related to extortion. In Session's Mayra Cuevas contributed to this report.